The English brig Caesar was built at Cumberland, Co., Durham in 1814. On May 17, 1818, while en route from Shields, England to Baltimore, she was wrecked on Bermuda's reefs. She was lost on a reef off the West End of Bermuda on the 17th May. The ship was heavily salvaged at the time of her sinking and telltale evidence of this salvage operation can be found around several docks at the west end where parts of her distinctive cargo can be found. The wreck was rediscovered lying in a sand hole in 35 feet of water in 1957 by Teddy Tucker who used Herbie Smiths old salvage boat “The Ruby” to salvage what remained of her cargo. Results of this salvage effort can still be found around Bermuda. Over 500 bricks were recovered and used in the renovation of the old Rum Runners Building and many of the smaller grindstones were used to make pathways at many of the Islands hotels and other Bermuda homes. This salvage effort led to the discovery of one of the most unique elements of her cargo; very distinctive Masonic flasks. Some of these flasks were already in Bermuda collections and the riddle of their origin was only discovered after the Caesar was found. Their uniqueness identified them as being passed down since the time of the original salvage. One of the most distinctive elements on the wreck itself is the remains of her cargo of grindstones. Today the largest grindstones can be still found on the site sitting atop of the wooden remains of her hull. Remains of porter bottles; glass necks and bases of black glass bottles are strewn throughout the sand hole and her exposed timbers, and lead birdshot collects in shallows on the site. Her remaining bottom timbers are clearly visible especially after the winter storm surges and she can be alternatively covered or exposed if there is an active hurricane season. This wreck is regularly visited by many of the dive shops mostly as a snorkeling interim between dives and also because it is sought out and enjoyed by underwater photographers. 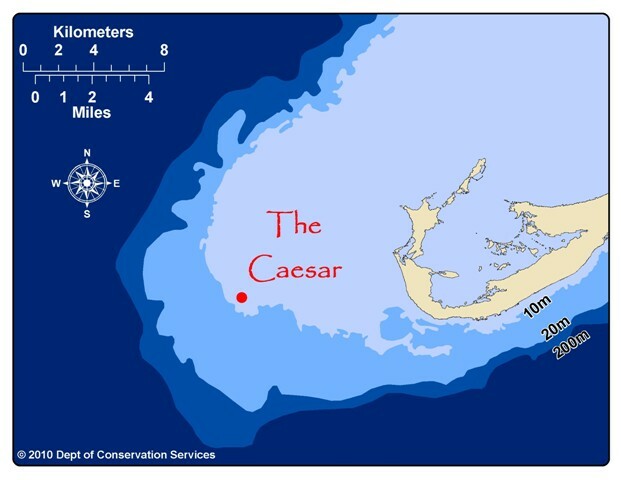 The Caesar is not a part of the Bermuda Dive Sites program.